Bad Mummy moment - I swore at my eldest because they were refusing to get their bike ready for a Scout cycling event as I was trying to tell the youngest that they couldn't ride their bike to the allotment - youngest took the opportunity of distraction to ride out of the garden on her bike whilst I was trying to get eldest to function and sort her bike out. My Dad say's this will be a funny story along with child trying to use a shoe horn to get me off the sofa whilst I am on the phone apologiesing for for forgetting his birthday that my mum had phoned me up to remind me not to forget - littlest was doing this because she wants a cat in her bedroom and she's not allowed to pick them up and carry them because she doesn't it properly and it's not fair on the cats. 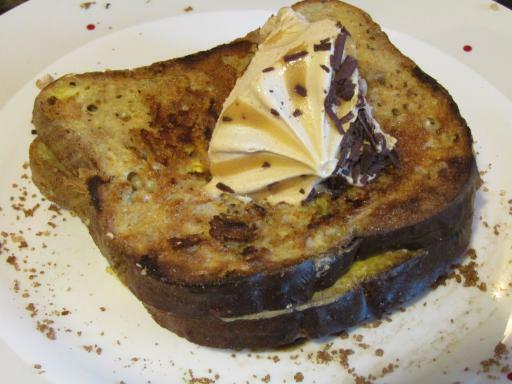 Feeling a tad frazzled = world is being hard work at the moment pretty sure I am failing at everything - so eggy French bread with caramel latte ice cream - GF whole mill bread dipped in whisked egg and dry friend and then dipped in brown sugar and cinnamon.